Bonio Mini Dog Biscuits have been made from a selection of wholesome and nutritious ingredients that have been oven baked to lock in all the delicious flavours and natural goodness. Made smaller for small dogs and enriched with vitamins and minerals, the crunchy oven baked texture of Bonio Mini also helps to keep your dog’s teeth and gums healthy. 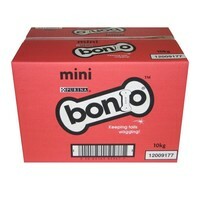 Bonio biscuits are a complementary pet food for adult dogs and are not a complete meal.